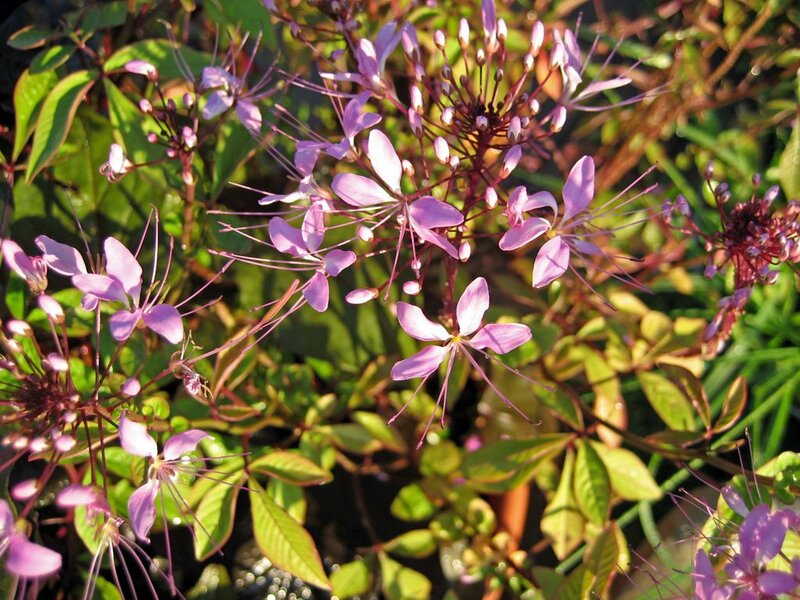 This is Cleome 'Linde Armstrong', one of the Athens Select plants bred to do well in hot weather. I also have some of the "regular" cleome, Cleome hasslerana, growing here and there throughout the garden where it sowed itself. I can take the self sowing of cleome because it's not as out of control as some self-sowers that I have unleashed upon my garden in the past. (Tansy and variegated sweet artemesia to name two, if you must know, but don't tell anyone. It is a bit embarrasing to have done that to my garden). Smell? I haven't noticed a bad smell coming from the cleome but I haven't stuck my nose right up into the flowers, maybe because I know it might not smell so good? The plant has stayed around one foot tall by one foot wide. 'Linde' might also self sow, but that would be alright with me. It's a nice plant! I always thought cleome had an unpleasant smell- but I also don't like some smells that others like, such as alyssum. Those are often described as having a "honey" like smell. Cleomes, however, were one of my grandmother's favorites (she lived for a time long ago in Gary, Ind -btw, when my mom was little)... and I think they are pretty and have an interesting form. Mine were usually much taller. -and thanks for coming by my blog- I love to find other Midwesterners too!